Charming farmhouse that has been restored and split into three apartments (IVC406, IVC496, IVC497), immersed in the greenery of a small well-kept park which is enclosed and equipped. 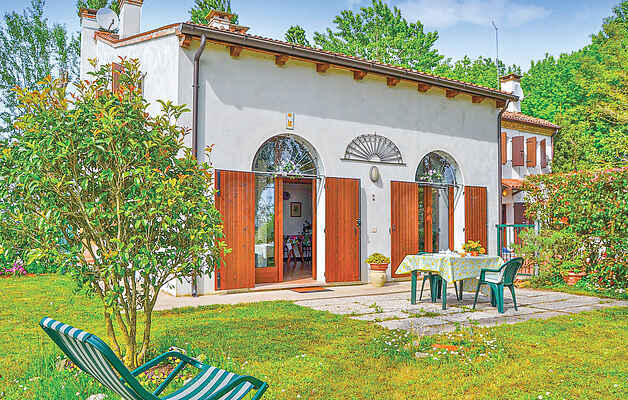 The house is surrounded by fields of a pretty farming estate near the sea, where there are excellent restaurants with sea food specialties and wine from the Piave area. 2 bikes for hire (to be requested upon booking and paid locally). Peaceful position. Baby-bed available upon request and local payment. No more than 2 pets are allowed upon request. Parking. Please note: for IVC497 overhead gallery with double bed opened onto the living/dining room. LOCATION: 2 km food shops, 4 km Ceggia (supermarket, various shops) and the beautiful and lively town of S. Dona di Piave, 8 km Eraclea (beaches where you can hire deck-chairs etc. ), 12 km Jesolo. A little further away are Aquileia (archeological centre) and Grado (historical bathing centre with beach and small harbor).